Ralph Alessi (trumpet and compositions), Drew Gress (bass), Nasheet Waits (drums) and Jason Moran (piano). I heard Thursday 10:30 set. It was quite packed (many seemed to be students or musicians). As a listener I felt this music didn’t speak to me that much – maybe one has to be Ralph Alessi’s composition student to grasp the ideas? I also wished he had introduced the songs just a little bit… Maybe that would have built some kind of connection. I thought Drew Gress played great, and naturally it was a pleasure to hear Nasheet Waits, but I guess it was just one of those night when the magic didn’t happen with the actual music. 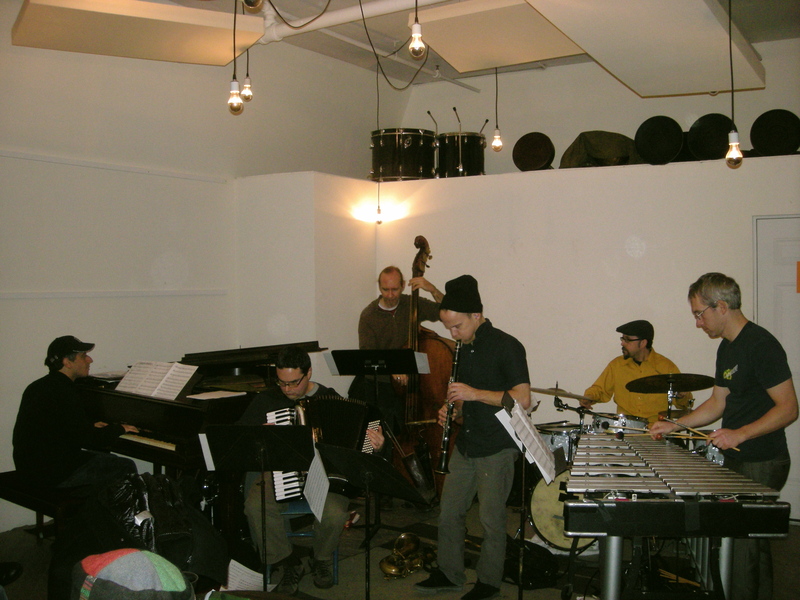 Konceptions – the jazz/experimental music series (curated by James Carney) in Brooklyn has been resurrected – it’s now Tuesdays @ an Eastern European restaurant called Korzo in South Park Slope (5th Ave between 19-20th St). The place is actually just a couple of blocks from Royale that has a jam session on Tuesday nights. That neighborhood seems quite happening as far as music is concerned – but weird how dead it seems to be at late hours otherwise. The first band in the series was Josh Roseman-Drew Gress-Mark Guiliana. I thought Mark Guiliana and Drew Gress were a really interesting match. Got a lucky invitation to see a show @ Birdland – John Surman – baritone and soprano sax, John Abercrombie on guitar, Drew Gress – bass, Jack DeJohnette on drums. It was an ECM Records CD release Celebration. Was great to see Jack DeJohnette live, finally! And I like Drew Gress a lot. It’s ridiculous how hard to please I’ve become in New York – I guess lately I enjoy all the new and modern stuff most. But I do love going to Birdland for free. Still, the best part of the evening was that I actually met a role-model for myself 😀 Was really inspiring to see someone with same kind of attitude and lifestyle – enjoying life in a cultural and tasteful way – and he’s a pro :D.
Went for drinks in the East Village later on. Found the Charlie Parker Residence. I almost thought I was going to miss hearing Tim Hagans (trumpet), John Abercrombie (guitar), Drew Gress (bass), Marc Copland (piano), Billy Hart (drums) @ Birdland, because of the cover charges. But by a strange coincidence somebody actually invited me – and there I was, premium seated eating steamed popcorn shrimp (really delicious) and drinking bottles of chardonnay. The concert really was as unmissable as the lineup was promising it to be. That was a great example of a good jazz group – everybody being so different, free to be the unique individual that they are and in the same time still be perfectly together. The only other occasion this might also happen, to such great exent, is in a family, I guess. John Abercrombie’s guitar sound is just incredible, something magical about it. One of my favorite moments was when Tim Hagans and John Abercrombie played duo, as an intro to one of the songs – that was almost just as beautiful as Freddie Hubbard and George Benson on Here’s That Rainy Day (on the album Straight Life). They played some originals, might have been Marc Copland’s songs and they did a really beautiful version of You Don’t Know What Love Is. Some killin’ drum solos by Billy Hart. I really enjoyed the concert! If you have money, Birdland is a great place to spend it. 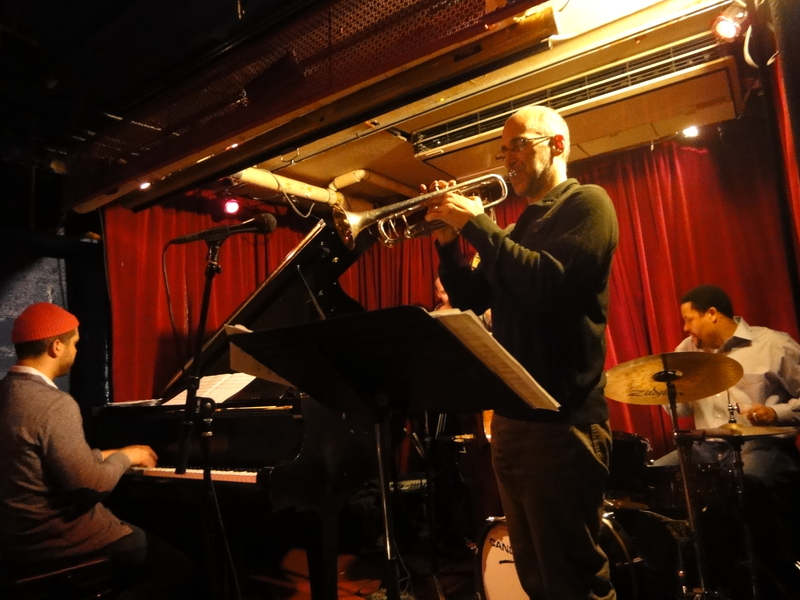 Went to the Jazz Gallery again, because – guess what – Marc Ducret played there with Angelica Sanchez Quintet (featuring Tom Rainey on drums, Tony Malaby on saxophone, Drew Gress on bass, Angelica Sanchez on piano). Otherwise, at times the piano was too quiet especially considering that it was her band – couldn’t hear everything (I was sitting in the 3rd or 4th row, middle). But yeah, it was all recorded and is available for checking out somewhere – didn’t catch it, where though – @ jazzgallery.org ? And well, guess I was mistaken and already recovered from yesterday – I do want to take pictures with famous musicians :D.
All the Things… New York Jazz and More by Ines Kuusik is licensed under a Creative Commons Attribution 3.0 Unported License.